Welcome to the Singapore cruise port guide. Singapore is a tiny country with 5,5 million inhabitants located all the way at the southern tip of the Malay peninsula. It is trendy, modern and bustling. It is one of the most powerful economies in the world known for its government efficiency, minimal correction and skilled workforce. How on earth it is possible that this country can be so successful whereas it has no natural resources? The city is unlike anything you can find in Southeast Asia. It is completely different because it was build differently. It went from mangrove to metropole in under 200 years. Stamford Raffles made a city plan for Singapore 200 years ago. This plan proved itself worthy. It was based on the rational and efficient idea that ethnic groups, commercial and residence has to be separated. With this idea he started to build Singapore on a “blanc canvas”. All the mistakes made during the colonization of other areas would now finally be a lesson learned and therefore Singapore is so different from other Asian cities. Singapore is the playground for the mega rich shaped by recently deceased Lee Kuan Yew, father of the nation. Now this Asian tiger is one of the leading countries in the world. The Singaporeans enjoy the best quality of life in Asia and it shows. Go explore this unique city and see for yourself why this works. Find out underneath what it is you want to do in this Cruise Port Guide Singapore. Most ships dock at the Harbour Front Cruise Terminal. From here you walk straight into the Harbourfront Cruise Terminal / Shopping mall. 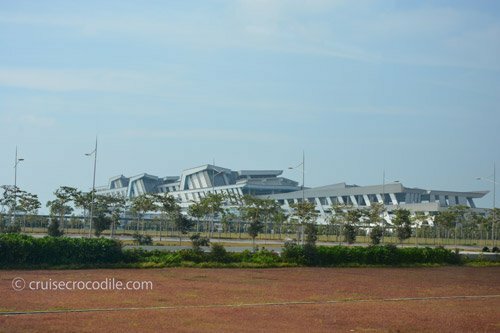 This building on the photo is the Harbour Front Cruise Terminal. It is a cruise terminal that has all you could wish for. Enjoy all the facilities they have here including the MTR station. It is hard not to be connected when in Singapore. Already in the tube of the cruise terminal is where you’ll find your first free connection. This is where you will exit the security zone and walk into the shopping mall of the Harbour front centre. From here just follow signs to any kind of facility: MRT, passenger services or taxi. In this hall you will also find ATM’s and exchange facilities. At the Harbour Front Cruise centre you will have all kind of facilities like: Tourist information, taxi information desk etc. The new cruise terminal is available since 2012 for a price tag of just 500 million SGD. 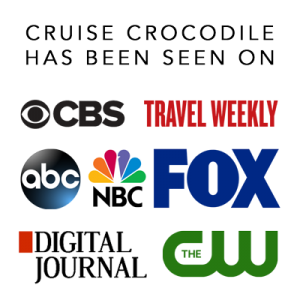 Check with your cruise line where you are goig to be docked. 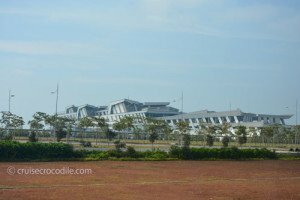 Since most of the times the Harbour Front Cruise Terminal is used this information is based on the Harbour Front. The sail into Singapore is a very scenic one. The Singapore straits is one of the busiest shipping lanes in the world. The main highlights of Singapore will be visible from the ship. So make sure you are on the outside deck 1,5 hours before arrival or visa versa. 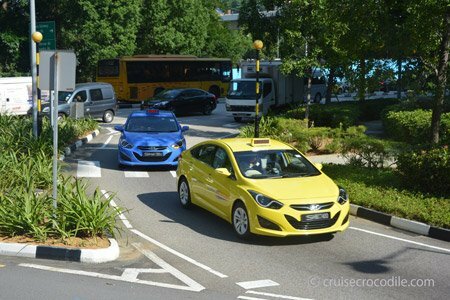 Taxis in Singapore have different colors although they often have a bright color like yellow or blue. Taxis operate 24 hours and can be flagged down. Taxis have a meter and you can often pay with credit card. Check the logos on the window. 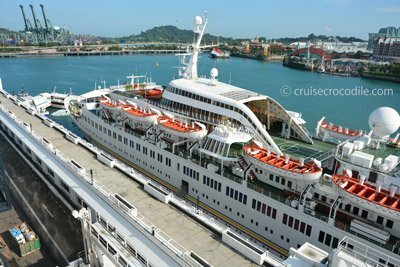 Most cruise ships still dock at the Harbour Front Centre although your ship could also dock at the new Marine Bay Cruise Centre. Public transportation is available at both terminals. Hopefully you will dock at the Harbour Front Cruise Centre because it might be just a little further from town, but you do have all the convience you would want. From the Harbour Front Cruise Centre you have so many options when it comes to transportation. You will find this is where you pick up the MRT (Underground system), taxis, buses, monorail or cable car. It is so easy. The system operates daily from 05:30 am to midnight. Fares range from 0.77 to 2.50 Singapore dollar. Standard tickets for single trip fares cost more than a day pass. Single tickets can be bought at the machine inside the MRT stations. The daycard or ez-link / tourist card can be bought from TransitLink Ticket Offices, It costs 10 SGD per day + a one time 10 SGD deposit. Roughly you could say that if you are planning on going by MRT for more than 5 rides in 1 day the ez link / tourist card will be worth it. The MRT is wheelchair accessible. Click here to be forwarded to the MRT website. Taxis are available at the terminal. The taxis don’t have a fixed color, but they always have a taxi sign on the roof. They do have a meter. Taxis can be paid with Singapore dollar or credit card. Check on the window of the taxi what kid of credit card he will take. 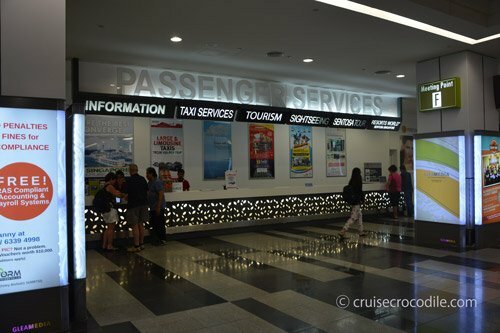 A ride from the cruise terminal to the airport is about 25 SGD. Any ride from the cruise terminal into town should never around 10 SGD. There is a hop on hop off bus available in Singapore. The cruise centres are not part of their normal loop. You can buy the ticket for the hop on hop off bus at the tourist information desk in the terminal and if enough people buy tickets the tourist information desk will arrange with the hop on hop off bus service to come pick you up at the terminal. If this is not the case you can pick it up at Suntec. – Do they take USD in Singapore? Generally no. Singapore dollar or credit card is the way to go here. – How far is the cruise terminal from the city centre? 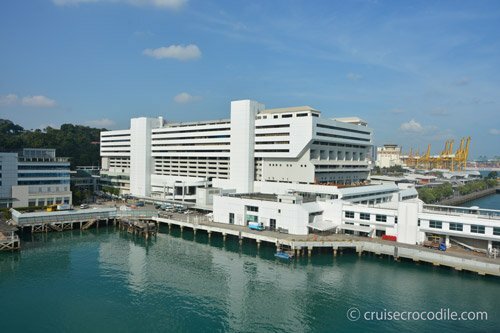 If you are docking at the Harbour Front Cruise Centre you will be about 7 km from the city centre of Singapore. 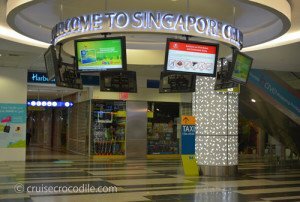 – Where can I change into Singapore dollars? In the cruise terminal. If you dock at the Harbour Front you will notice there is a cable car going over the ship. This cable car goes to Sentosa Island. It is a fun way to reach the island. Follow the signs in the cruise terminal that say Cable Car. You can also take the mono rail from Vivocity to Sentosa. 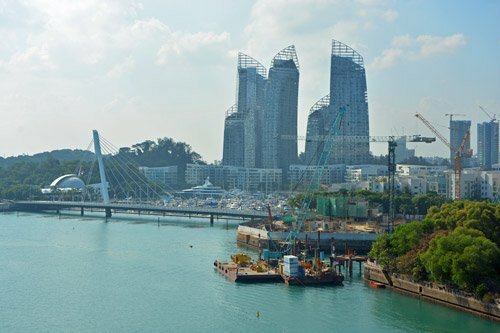 This is the waterfront location just north of the mouth of the Singapore river. Along this boulevard you will find all kind of venues like the Theaters on the Bay and the Queen Elizabeth Walk. It is also the perfect spot to view the Laser and Water show that takes places here in the early evening. An interesting museum housed in a historical building by the Singapore river is much more than a history lesson. With Singapore being such a melting pot of Asian cultures it is only right to have a museum that takes a grand exploration through the many cultures on this continent. 14.000 sq m space and 11 galleries display all kinds of artefacts from China, Southeast Asia, South Asia and West Asia. This lies opposite the Harbour Front Cruise Terminal. Sentosa island is Asia’s fabourite playground. On the island you will find Resorts, Siloso Point, Imbiah Lookout, Hard Rock Cafe, Golf courses and beaches. 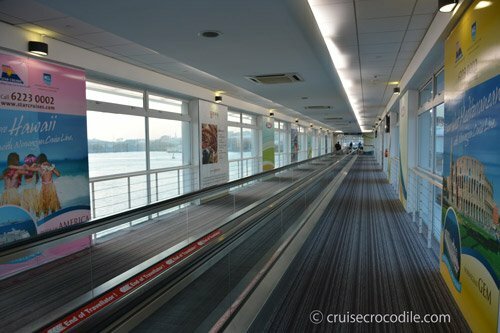 Reach the other city by taking the monorail from Vivo City or take the cable car close to the cruise terminal. This multi-award winning attractions is something not to be missed. Find 101 hectares of reclaimed land on which you will find one of the most spectacular gardens in the world. Explore the super-sized trees, the forest in the clouds, the flower dome, dragonfly and kingfisher lakes and much more. Reach it by MRT stop Bayfront or taxi. Also known as the fountain of wealth. Until 1998 it was the largest fountain in the world. This large fountain build according to the rules of feng shui has a fountain that performs laser shows in the evening and during the day people can access the smaller fountain in the middle. Merlion is your mandatory photo stop in Singapore. This symbol of town represents Singapore (the Lions city) and Singapore as a fishing village. The statue now stand on the Marine Bay reservoir. Make sure to pop by! One of the most luxurious malls of Singapore is the Marina Bay Shopping Mall. Find the international luxury brands and local labels in a unique piece of architecture. Find this shopping mall in front of the Marina Bay Sands Hotel. Reach by +/- 12 SGD taxi or at MRT stop Bayfront. This neighborhood teels the story of Chinese Heritage in Singapore. The largest ethnic group of Singapore is Chinese and therefore this is one of the most important districts. Find lots of cute shopping streets here for good prices souvenirs. Clarke Quay is a historical riverside quay. Nowadays it is mainly known for its entertainment and restaurant district in the evening. Marina Bay Sands oberservation deck The oberservation deck on the Marina Bay Sands hotel is simply something you have to do while in Singapore. But if you are planning to go up there, why not go for a drink at the bar of Ku De Ta. Follow the signs in the lobby of the Marina Bay Sands hotel. The deck is open everyday from 09.30 am to 10 pm. How to get into the Marina Bay Sand Hotel pool? This is one of the most famous pool in the world. The only way to get into the pool is by booking a hotel room in the Marine Bay Sands hotel. Only hotel guests are able to use the facilities here. Just up the Singapore river we find the historical Boat Quay of Singapore. It used to be the busiest part of the old port of Singapore, nowadays it houses various bars, pubs and restaurants. Go here for a nice drink or dinner with a view. At this unique Chinese temple you have to step into the fun. People come here wanting an answer from the Goddess of Mercy. they come her to get a tangible fortune prediction. Step inside, see if you can find out the ritual and join in. You’ll find lots of different markets in Singapore. One of the best to visit is the Tekka Wet Market in Little India. Visit this market if you want to know more about Singaporeans and their way of life. Maybe even plan ahead and have lunch here in the local hawker centre. What in the 50’s and 60’s was known for its nightly gathering of trans women is nowadays known for being a shopping paradise. Get your souvenirs here at reasonable prices or get your local snacks here. Enjoy a beautiful cruise on one of the bumboats. 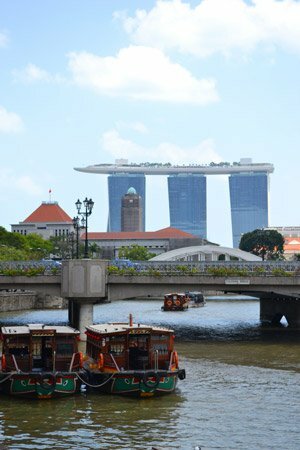 It shows you a different Singapore from the water and it is a great way to see a lot in short amount of time. Pick it up at one of the 9 stops (Promenade, Bayfront south, Esplanade, Merlion park, Fullerton, Boat Quay, Clarke Quay, Read Bridge or Robertson Quay). This shopping mall is the largest in Singapore with over 340 shops. For the shop-a-holics: you don’t have to go far, it is located right next to the Harbor Front Cruise Terminal. From the terminal it is about 300 meter walk. This famous Ferris wheel in Singapore was the largest one in the world until surpassed by the Flyer in Las Vegas. Still it standing tall with an impressive height of 165 metres / 541 ft. Step in for unforgettable views over Singapore.